Normally, I’d be skeptical of a book titled How to Cook Everything, but when I learned that the New York Times “Minimalist” columnist Mark Bittman was writing it, I had to take a look. 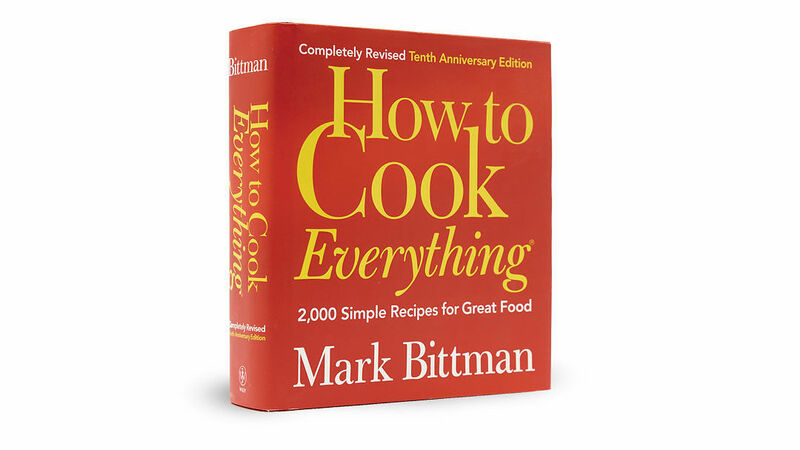 Reading his introduction, I found that Bittman’s goal is to convince everyone that cooking is a simple, everyday art, and that we’re all capable of making easy, satisfying meals for friends and family. He disdains the extremes that cooking has fallen to (the “convenience” crowd thinks that reheating packaged stuff is cooking; “gourmets,” on the other hand, have tried to turn cooking into a form of high art that can only be performed occasionally and elaborately for a crowd. Bittman feels that with the abundance of fresh food available to us in our markets, we can all get delicious meals on the table every night without a lot of hoopla. And then he backs up his premise with 1,500 examples. His recipes are all refreshing because they reflect modern tastes; the appetizer section, for example, is defined by recipes that everyone wants to have, such as Guacamole, Hummus, and Tapenade. The other chapeters follow suit with recipes for Salade Nicoise, Spaghetti alla Carbonara, Grilled Pizza, Roast Turkey & Gravy, Cassoulet, and Chocolate Souffle. Bittman has a rare gift for writing uncomplicated recipes, and amazingly, a huge percentage of these recipes can be prepared in little more than half an hour. And many recipes come with options: Bittman gives you the tools to prepare something, and then he offers many different ways to flavor it. Cooks at all levels will get a lot out of this book. One day I turned to the book to learn how to peel and cook plantains; another day I made a quick dinner of moist seared cod fillet with a spicy garlic sauce, following Bittman’s instructions. An excellent glossary, temperature, and measurement charts, menu suggestions, sources, and 250 black-and-white illustrations all make this nearly 1000-page book worth much more than its $25.